These are the little ones. The most important feature of mosses and liverworts is that they have no vascular system. A vascular system in plants is a series of tubes that can transport water and nutrients over a distance. That vascular system of xylem and phloem allows redwood and sequoia trees to grow to over one hundred feet tall. Without a vascular system, mosses, and liverworts cannot grow very large. 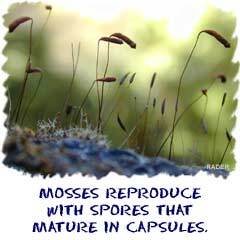 If you have seen mosses, you know that they are actually carpets of individual plants. They are rarely taller than one inch high. Another important characteristic of these little guys is that they require water to reproduce. It's another characteristic of their low place in plant evolution. While all plants need water, mosses and bryophytes need droplets of water to enable their haploid reproductive cells to combine. They are all known as the bryophytes. Let's start with mosses. These are waxy little plants with no leaves and no stem that use each other to stay upright. Their inability to stay up is why you never see one little moss plant; it's always a group. That grouping also helps them retain water in the area. A waxy covering across their bodies helps keep water from evaporating. You will usually find them in moist areas out of the direct sunlight. We'll cover liverworts and hornworts together. If you can believe it, the worts are even simpler than mosses. These are considered to be the simplest of all plants and often grow flat along the ground in large leaf-like structures. None of the bryophytes have roots. They all have rhizoids (little hairs), and the worts are no exception. 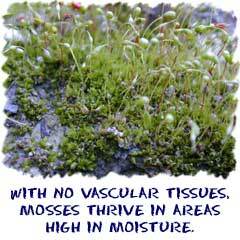 Like mosses, they are found in very moist areas, and some species even spend their whole lives in the water.